I've made some very tasty steaks on the grill. I use an entire chimney's worth of charcoal, probably 3-4lbs, let the grill get extremely hot, thrown on the steak and still not gotten nice pronounced sear marks. 1. Coat in kosher salt. I generally only let it sit for at most, 3 minutes, I like my steaks blue rare. But, I recently cooked for family and they like theirs medium. So I let the steaks sit for 6 minutes on each side, still, no pronounced grill marks. I have the same problem when I cook burgers, no matter how long I leave them, never seen any pronounced grill marks. Grill marks are a sign of a really hot grate. As in really, really hot and well pre-heated. You want your grate to sit over the hot coals for at least five, some sources say fifteen minutes. If your gril has a lid, close it! a) Water will in fact insulate by forming a "protective" steam layer, so dry your meat. Use paper towels or whatever you prefer, just remove any surface liquid. This includes wet marinades, too. b) Oil aids in the heat transfer, this is the reason we use some oil in a frying pan, too. You should always oil your food, not the grates, because you avoid flare-ups and the oil helps any seasoning - if used - stick to the meat. A light coating is sufficient. Place your meat on the grill and wait. A proper grill mark needs some time to develop. Your meat will release itself from the grate once the "lines" are seared well. Do not rush this or your grill marks will remain on the grates as sticky residue, not on your steak. Optional: Turn your meat 30° or 45° to create a diamond- or cross-hatch pattern. Flip, repeat on the other side. For those who love rare meat and thin steaks, there is simply not enough time to create a proper cross-hatch on both sides of the meat, possibly not even for a 45° turn. So rather aim to create one nicely defined set of marks than going for a mediocre pattern or a dry steak. On the other hand, there are those who prefer a well-done brick of meat, which will not be at the desired doneness after searing both sides. Use indirect heat on the side of the grill to finish your meat until it reaches the proper temperature. It isn't how hot the grill is, it is how hot the grate is. If your coals are too far from the grate you are introducing some baking aspects to you cooking. When I grill a steak, my grill is on high and gets to around 550F. My grate is an inch from the flames and literally is dancing with flames. The meat hits the grate and depending on thickness probably only spends 2-5 minutes on that side. When I flip it I have grill marks on the down side and my uncooked side has NOT developed a skin. If your uncooked side has developed a skin then you either let it cook too much on that side or your grate is not hot enough. The shape of the grate bars are too round/thin and steak isn't sitting flat on them. Heat source is too far from grate. 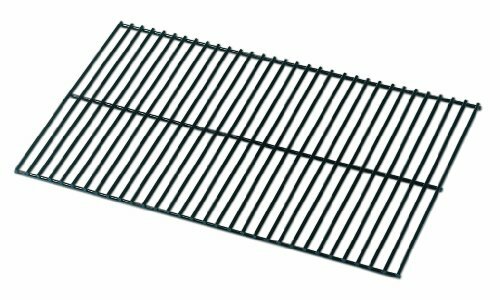 Buy grates that have bigger bars. Let your grill warm up more. I always clean my grill prior to cooking - so cleaning from my previous cooking. I figure when cleaning I need the grill super hot and that's how I like to start cooking. Try to throw some olive oil on grate a minute before meat - this will help it heat up and help with sticking. Don't cover the grill. This allows you to cook longer on the grate side and not bake your meat. The more area they cover, generally the better they are at absorbing the heat from below and becoming the heat source for your meat vs. the ambient temperature. The picture below is an example of a standard grate you get with a cheap grill. Not that it is round rods, that they are small, and there are big gaps in between each one. This is the worst of all world as far as getting a char mark. There are a variety of materials. I use stainless steel because it is durable, cheaper, easy to clean and holds heat well. You can make a case for cast iron but there is more maintenance there. I don't like porcelain coated because they tend to chip and they don't hold the heat as well. Brown is flavour, black marks are just that, black marks. They don't add to the flavour, and many medical reports suggest they are not good for you? Not the answer you're looking for? Browse other questions tagged grilling steak hamburgers or ask your own question. Why do burgers sometimes fall apart on the grill? Can I get 900F in a charcoal grill?